WHACK!! I’m between first and second base watching batting practice. Coach Conroy’s pitching to each player until they hit the ball. A few take a lot of swings. WHACK!! Others one or two. WHACK!! I’m shagging balls and tossing them back to the pitcher’s mound. WHACK!! There’s movement in the bleachers behind first base. It’s Greg. WHACK!! Oh my God, he looks good! Doris is with him. Damn! WHACK!! Why’d I fall for a guy who’s so obviously straight? Doris pokes Greg’s arm and points to me, and they both wave. WHACK!! Someone yells, “Duck!” then my head explodes and everything goes black. 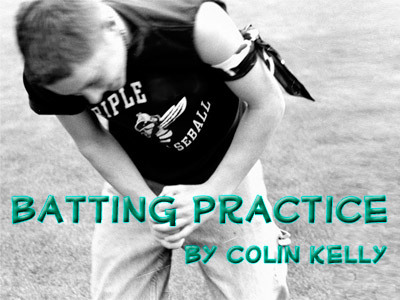 This story and the included images are Copyright © 2008-2010 by Colin Kelly (colinian). They cannot be reproduced without express written consent. Codey’s World web site has written permission to publish this story. No other rights are granted. If you enjoyed reading this story, please let me know! Authors thrive by the feedback they receive from readers. It's easy: just click on the email link at the bottom of this page to send me a message. Say “Hi” and tell me what you think about Batting Practice. Thanks.